A study confirmed for the first time what many already knew—ever increasing numbers of those enlisted in the US military had their roots in rural America. 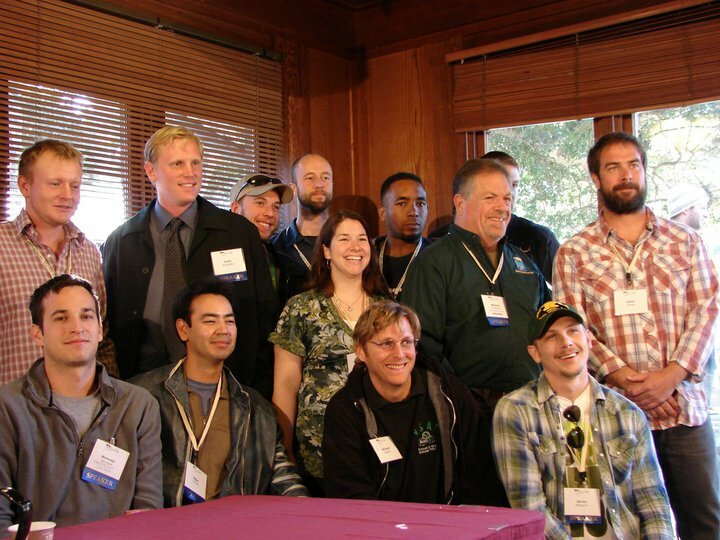 On May 6, 2007 Michael O’Gorman organized a gathering for farmers in California’s Central Coast to talk about creating jobs on our farms for returning veterans. Michael was farming in Mexico at the time, overseeing 1,600 acres of organic tomatoes, peas, basil and other fresh market produce for Jacob’s Farm/Del Cabo. But he had a long history of farming in California and knew many other growers there. Among those attending the Sunday meeting at Swanton Berry Farm were three women who had all lost their sons in either Iraq or Afghanistan – Nadia McCaffrey, Dolores Kesterson and Mary Tillman, mother of Pat Tillman, who left a lucrative football career to serve his country. The idea of opening up our farms – and all the beauty and peace and opportunity that they provide – to those returning from war, captivated those in attendance. The Farmer Veteran Coalition was born. Over the next year, the small group of volunteers searched the country for other organizations with similar missions. Of 40,000 groups organized to help veterans nationwide, we could not find one with the mission of introducing veterans to agriculture and none that addressed the new dynamic that our military would be returning, in large numbers, to small towns across the country, far from the services available to veterans in more populous areas, and just as far, sometimes, from the type of career and lifestyle the veterans we worked with were wanting to pursue. In January, 2008 O’Gorman left his job at Del Cabo, and a nearly forty year career in production agriculture, to begin working for the Farmer Veteran Coalition (FVC) full-time. O’Gorman felt that his personal journey, of going into agriculture with no money, land or education nearly forty years earlier, and becoming one of the country’s most prolific organic farmers, could help a new generation of new farmers. O’Gorman believed deeply in American Agriculture and that it was ready to provide great opportunities for the men and women who had put their life on the line for our country. Things were slow that first year, but of the dozen or so veterans that O’Gorman was able to work with, all of them remain in touch with him and many have launched successful agricultural careers. In February, 2009, FVC became a project of Community Partners of Los Angeles and opened a small office in Davis, CA. Soon afterwards we got our first significant funding from the Iraq + Afghanistan Deployment Impact Fund (IADIF), which was handling the nation’s largest private donation made on behalf of American veterans. IADIF had vetted 50 groups a year earlier, formed the Coalition for Iraq + Afghanistan Veterans (CIAV) and distributed most of its money. FVC came in as the Coalition’s 51st group when its leaders recognized the unique program we had to offer veterans. In October, 2009 O’Gorman was invited to speak at the CIAV’s Government Partners’ Day. A dozen key leaders from the Department of Agriculture (USDA) attended the talk and heard that not only were these returning veterans critical to the Department’s goal of 100,000 new farmers but that they were needed to rebuild the rural communities that have now become an essential component to providing our military’s manpower. FVC had found its greatest ally: the USDA. As FVC grew, so did the number of men and women looking to us for help, many of them begging for anything we could do to help launch their farming career. We felt a tremendous sense of responsibility to create an organization capable of doing everything it could to serve this important sector of veterans that remained overlooked by most of the urban based veteran organizations. FVC drafted its Guiding Principles stressing our support for every veteran’s path into farming; our equal support for both employment and self-employment in Agriculture; and our commitment to collaborate with all national and regional groups that shared our goal of helping veterans enter our agricultural community. In 2013, FVC entered into milestone agreements with the American Farm Bureau Federation, Farm Credit Council, and National Farmers Union. These were not statements of passive support, but deep commitments of their leaders to put the full force of their organizations behind our efforts. Our new national Board of Directors of FVC included representatives of these three organizations, and our partnerships have permeated all aspects of our growth. Another key partnership was developed with the National AgrAbility Project. AgrAbility was formed to “enhance the quality of life for farmers, ranchers, and other agricultural workers with disabilities.” With more than half of the veterans we work with having service connected disabilities, this partnership has been a journey to understand Post Traumatic Stress, Traumatic Brain Injury as well as the physical injuries from combat, and how we can help veterans lead successful farming careers despite these obstacles to overcome. In 2012, during the rewriting of the Farm Bill, key Senators, Congressmen and their staff sought FVC’s advice on how to support veterans in the new Farm Bill. With no money or time allotted to advocacy, FVC successfully pushed for the new office of Military Agricultural Liaison, the recognition of veteran farmers, the expansion of the micro-loans and numerous efforts to give veterans preferential access to conservation programs, all things that got written into the Agricultural Act of 2014. These were historic milestones for the effort to bring more veterans into agriculture and the White House extended an invitation to FVC Director, Michael O’Gorman, to attend the signing of the bill on February 7, 2014. In January, 2013 the Kentucky Department of Agriculture (KDA), under Commissioner James Comer, launched the Homegrown by Heroes campaign, designed to give the state’s farmer veterans recognition in the marketplace for their military service. FVC had long sought a label for veteran produced farm products and approached the KDA to see how we might work together. On Veterans Day, 2013, with Senator Mitch McConnell, Congressmen John Yarmuth and Andy Barr, and Louisville Mayor Greg Fischer in attendance, Comer announced a partnership with FVC that would give us the sole license to promote and certify Homegrown by Heroes in all fifty states. A check for $250,000 to launch the campaign was issued by Farm Credit Council. In November, 2014 FVC sponsored the first Farmer Veteran Stakeholders Conference in Des Moines, Iowa in partnership with the Agricultural Law Center of Drake University. Two hundred government, non-profit, corporate and private leaders from around the country met for three days to foster collaboration and mutual support for all efforts to support veterans in Agriculture. One other memorable moment at the conference was a podium shared by ranking members of the USDA, Department of Labor, Small Business Administration, Department of Defense and Department of Veterans Affairs. For the first time ever, five key departments of the Federal government were sharing ideas about a critical, yet previously ignored, sector of those returning home from service. This dialog is continuing and growing today. FVC continues to see meteoric growth in the number of veterans we work with. In a twelve month period ending March 31, 2015, FVC signed on more than 2,000 new members, bringing our total number of veteran members to over 4,500. Of these, 72% have post 9-11 service, 20% are ethnic minorities, 16% are women and a staggering 59% have service connected disabilities. Almost half of the veterans who contact us have some access to land. FVC is no longer a project of Community Partners, but its own independent 501c3 with a Board of Directors made up of key agricultural leaders. Our staff in Davis has grown to 12 and another six work on our behalf across the country. Eleven of the sixteen are military veterans, ten with post 9-11 service. Our projects have grown so that we can now offer various services to any veteran that contacts us at any phase of their career development. These new contacts now surpass 300 per month – with an endless variety of geography, experience, farming plans and resources – so we remain indebted to all those groups and individuals that make us much bigger than just our organization and staff. Our vision of the future is an organization that will be around for decades, in every state and continuing to unite the agricultural sector – government, education, private industry, conventional and alternative farming and the veterans themselves. It will no longer be important to know how and when we began, but that we will be there, offering assistance to all those who chose to serve their country twice – once by defending it and once by feeding it.